The Fill Selection option lets you fill the same value over an entire selection. The selection can be over one cell, a cell range in one column, a cell range over many columns, an entire column, or many columns. You can use numbers, words, letters, or any alphanumeric value. ‣ In the top menu, select Animation > Cell >Fill Selection. ‣ Click the Fill Selection button in the Xsheet or Timeline view toolbar (you may have to customize the toolbar to display it). 3. In the Value field, type the desired value. 4. 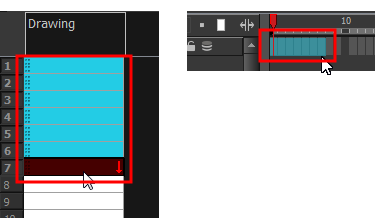 To insert a keyframe in the frame following the last cell in the selection, select the Add Key Exposure After option. Otherwise, leave it deselected.